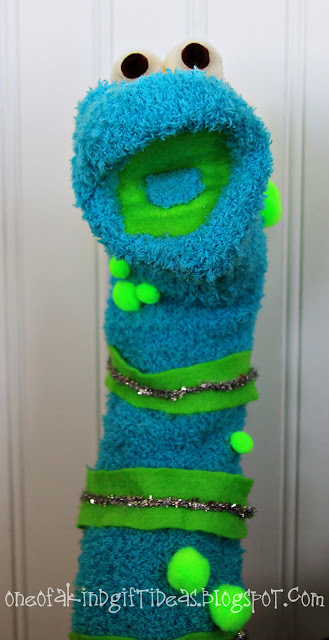 One of a Kind: "I See a Monster" Sock Puppets! 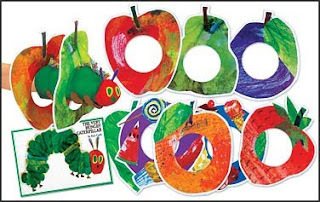 You give the gift of The Very Hungry Caterpillar book along with a sock puppet that looks like the caterpillar, and food with holes in it that he can eat through. This book is a touch and feel book all about the different kinds of monsters this little boy sees. If you click on the book it will take you to Amazon, but it was cheaper at Walmart. Then again, what isn't cheaper at Walmart? 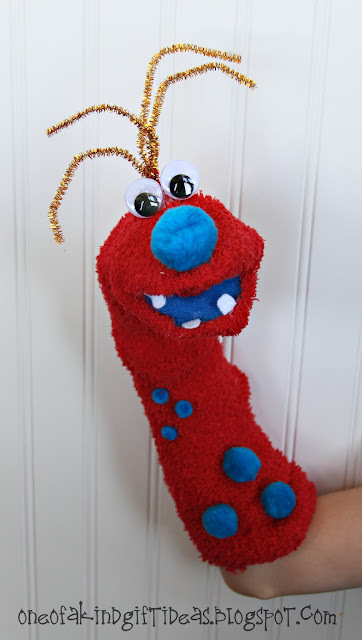 So I went over to the socks department and picked out a few monsters from the book that I liked and thought I would give it a go at making resembling sock puppets. 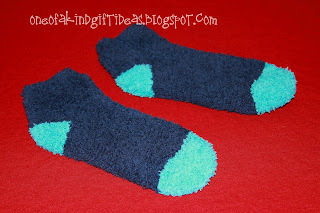 I couldn't find any fuzzy socks that were long so I had to get a few pairs of ankle socks. 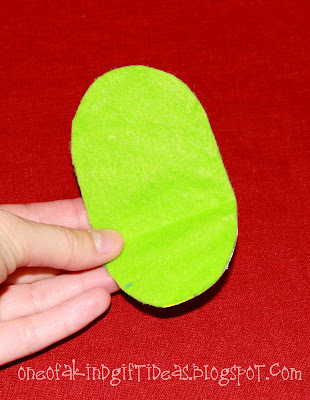 IMPORTANT TIP: I found that when you are gluing the two socks together, it helped to have your fingers stretch the socks out as the glue was drying, otherwise it would dry and not be able to stretch at all when you try to put it on. You may get a few glue gun burns, but its not really a good project unless you do right?!? 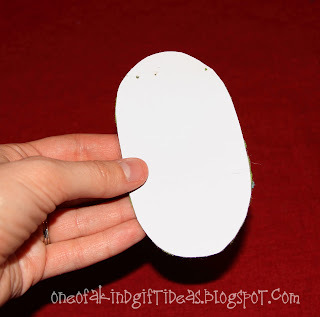 Then I hot glued some felt onto the cardboard. 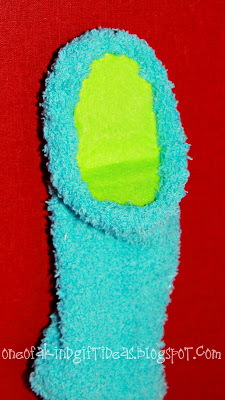 I used a different color than the sock itself so it would stand out. 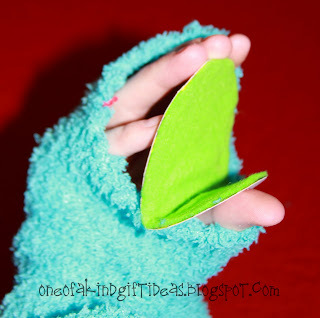 (Think Sesame Street puppets). If you enjoyed this post Subscribe to One of a Kind Gifts here! So clever- I love it!! These are so cute! I love the red one with the teeth!! 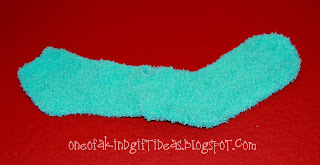 I am now going to have to find some fuzzy socks!! So fun! Thanks! those are darling! 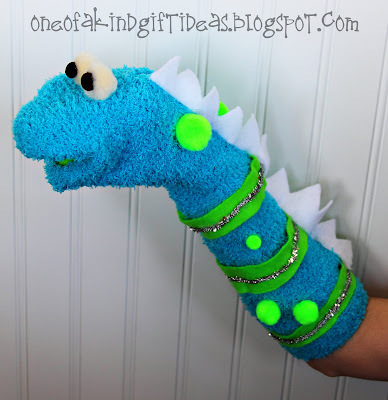 I would love to feature these on my baby and kids items feature coming up. I will let you know when it posts! Wahoo! We can't wait. Thanks so much! 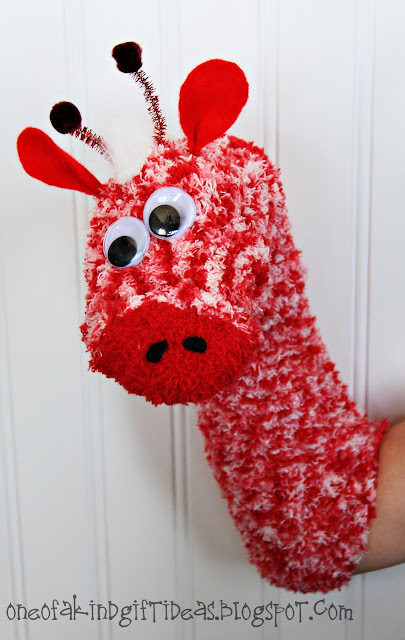 One more thing to mention- the last puppet looks a lot like a giraffe. You could make all the puppets different animals in a zoo like a lion, zebra, monkey, etc. Thanks for the comments! 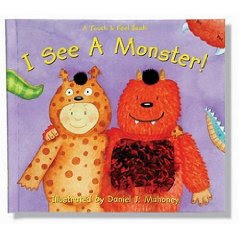 We are the publisher of I See A Monster and think these are so cute! Would you let us do a blog post featuring this idea with your pictures (I'd link back to your post and credit you) on our blog? I don't know how on earth I missed this comment. Please do! If you are still interested just let me know. We would love for you to feature this. Thanks for your interest! Our Most Popular Ideas According to YOU!